VM: — Now, let us come to Brexit. VM: — Brexit, the election of Trump, growing popularity of right parties in Europe. Do these events have the same reasons, or they are the results of different trends? MR: — They have some things in common, but, inevitably, each country is different. In some cases it is populism. But again I come back to the point: the United Kingdom is in a unique situation. Many countries are Eurosceptic – in Poland, in France, in Netherlands. But because of their history they see being the European Union as reinforcing their democracy and their rule of law. And if I was from these countries I would cheer on EU. So they put up with the things that irritate them in the EU but they see it as overriding benefit from being in that structure. The United Kingdom is a very lucky country, we have not been invaded for a thousand years, since 1066, successfully. And our parliamentary system, our rule of law, has been uninterrupted since 1640s, since our civil war. It’s not perfect, but we’ve had a parliamentary system, we’ve had a rule of law, independent courts, getting better and better as it happens over 300 years. So, for us, if we are Eurosceptic, we say, well, we are not prepared to put up with this kind of aspiration of a supernational European government or European court telling us what we can do and what we can’t do. And that has been an issue of Great Britain’s relationship with the EU for many years, and that’s where Britain is different. And because we’re an island, we’re geographically that much different, we are to Europe what Japan is to Asia, a large separate country because it’s an island, culturally and historically has had a different historic experience. VM: — What is the reason for the rise of the right-wing parties? MR: — I can tell you. Because throughout the Cold War there was an overriding issue that dominated politics, which was what is gonna happen, how is this cold war going to end? Is Communism going to become the dominant political and economic system throughout Europe or will it be the other way round? And when you have some existential threat of that kind, then people are preunited in opposition. Some may support Communism, but the vast majority will be against. But the politics operated within that framework. And the countries of Eastern Europe, Poland, Hungary, Czechoslovakia, their main anxiety was that they will be able one day to become truly independent again and not be forced to adopt Soviet system, Soviet model. When we had the end of Cold War, it wasn’t the end of history, it was the end of particular kind of history. And so Communism is no longer a threat, whatever one thinks, Mr. Putin is not a Communist, he is not instituting Communism. There is no longer an alternative ideology that divides Europe or divides the world. The ideology is gone! Of course, there are different kinds of capitalism, there different kinds of role and the government, but it’s all still basically a capitalist system. And against that background we need to have alliances, whether the European Union or NATO. Some people say they are too supernational and we don’t think like that. It is easier to argue that if the external threat is gone. We have seen what has happened in the case of NATO and Europe. There was a debate about whether NATO should have a future, until Mr. Putin started to do what he did in Ukraine. And right on their own people say: “Crikey, we do need NATO!” Once again there is a potential threat from Russia. They may be exaggerating, but that’s what they feel. VM: — Recently, the British Supreme Court has taken the decision that the UK government could not start the process of leaving the EU without the decision of the British Parliament. That decision created a real threat to Brexit and could lead to confrontation. The UK government has successfully overcome the crisis by passing in the Parliament, as you had predicted during our last meeting, the resolution allowing the government to initiate Brexit. The British government has initiated Brexit. However, it looks as if the confrontation is still possible. Tony Blair has called to “explain” people that they can still turn down Brexit. It looks as if some kind of an organizational center of the opposition to Brexit appeared in the UK, coordinating and boosting the opposition to the government. What is your opinion? Do we see the rise of the new political opposition, new political force? MR: — No, I don’t think so, because of two reasons. First of all, the government had already realized that the Court would reach this conclusion and had already been planning how to deal with that. So what it was an act of Parliament that was put before Parliament to ask the Parliament to authorize. And the Parliament divided, there was opposition. But the government have the support of a very large majority, because even people, who would have liked at present to remain in the European Union, most of them say: “Well, we have a referendum”. We promise the people this will not just be advisory, we would respect the decision. They have voted to leave, therefore we must do that. I mean, I voted to remain, but if I was a Member of Parliament I would accept that we now must start the business of leaving. VM: — So, you don’t think that there will be political crisis? MR: — There won’t be a crisis. VM: — The recent events in the US, including the resignation of the national security adviser Michael Flynn, have created an impression that anti-Trump organizational centre has also appeared in US and has already started actively working on impeachment of the US President. Who do you think form that centre or operate as its coordinator? MR: — I do not agree with your analysis. Michael Flynn lied to the Vice-President about his discussions with the Russian Ambassador. We do not know whether Mr Flynn’s discussions were with or without the knowledge of Mr Trump who was not yet President when the conversations took place. I am not aware of anyone working to achieve the impeachment of Trump . VM: — In Russia there is a growing feeling of a global war danger, of a possibility of a global war. VM: — Is a global war possible in the modern world? If it is possible, where it may start? MR: — Nobody can say it’s impossible because things can happen by accident or by stupidity. But the single most important reason why people in Russia think there might be a global war it’s because the Russian government has told them there might be a war. I have a personal experience of this. I served on the OSCE, eminent persons panel, there was a Russian colleague on that panel, and his contribution was the same as speeches in the Kremlin. Saying: “Ah! The way NATO is behaving! We must get used to the fact that nuclear weapons may be necessary. Russia will not hesitate to use its nuclear weapons if it needs to”. That kind of language which nobody in the West has used. Trump does not use it, hopefully not yet anyway, and no American President or British Prime Minister has used that kind of language. Although we have deep differences on Ukraine and other issues. The idea is that it is relevant to whether we will get into a nuclear exchange. VM: — Do you think that this is because of the language? MR: — Deliberate language. I think what I believed has happened. VM: — Or because of the actions, real movement in this direction? MR: — No. I believe the Russian government had two objectives. First of all, was to keep support in Russia for its policy by saying the West is so aggressive and so hostile this could lead to another war. But I think they had a second objective and still have the second objective which is trying to influence public opinion in Europe and in America to make people soon nervous about what it might lead to, a third World War with the nuclear weapons. And that Western governments will be under pressure from their public to be more helpful to Russia, to consider more than they might otherwise. I think that’s been part of a deliberate strategy. I don’t think Putin wants a war, I don’t think he will maybe want a war. You have to be a lunatic to want a nuclear war. So, but the language that suggests nuclear weapons might need to be used has become… I can give you a dozen of extracts from speeches of Russian leaders. I cannot give you a single extract from any American, or British, or French or German leader suggesting the same. It’s been a deliberate choice of rhetoric. Very determined. VM: — The last question. This is about Litvinenko case. MR: — Litvinenko? Yes, yes, absolutely! VM: — What is your opinion on Litvinenko case? Ten years have passed, but there are many points not clear and the case is still influencing the British-Russian relationships. What do you think that United Kingdom and Russia should do to close this page in the bilateral relations? MR: — Well, it goes back to what happened. What happened was that in the streets of London a citizen, a person was poisoned. He died of Polonium poisoning. And the evidence points to this being done by people from the Russian Federation. We had an inquest, we have our inquest not controlled by politicians. Our judges are not able to be told what to do, they did a very deep inquiry. That inquiry led to a conclusion, which was also the conclusion of our intelligence agencies and of all the others who delivered to this that it was undoubtedly a Polonium poisoning, they have identified the individual responsible. Litvinenko was a British citizen at the time of his death. No one in Britain doubts that Litvinenko’s murder was ordered in Moscow. And how does the Russian government react? It appoints the individual responsible to the Duma and treats him as a hero. So, I’m afraid, you know, Russian government, Mr. Putin is an ex-KGB man, you know, he is familiar with this sort of tactics against the enemies of the state as they’ve all seen. The refusal of the Russian authorities to allow a proper investigation combined with the appointment of his alleged killer to the State Duma has poisoned efforts to improve bilateral relations. And if your questions are how we can improve relations… Some acknowledgement of responsibility. Now it is just missing. It is propaganda and fabrication. Would be helpful. There is now, in my view, a serious interest on the part of the British Government to see whether 2017 can see the beginning of better and more positive co-operation between the two countries. The visit that will soon take place of the Foreign Secretary, Boris Johnson, to Moscow will be an important diplomatic development. Johnson will not be going to Moscow with any great expectations. In a recent interview, he said “Russia needs to give a sign that it can be trusted”. Trust, as I indicated earlier in this interview, was what developed between Thatcher and Gorbachev. Without trust there would have been no peaceful end to the Cold War. Without some rebirth of trust Russia and the West will not resolve their current differences. VM: — I agree with you that the reaction of Moscow is very strange. There was no investigation, no explanations were given. The former Russian officer, the officer of the FSB, dies of polonium powder in London, and Moscow officially does nothing to investigate this case, to protect the reputation of Russia, FSB, Kremlin, Vladimir Putin, who is openly blamed and accused in the West… I think that they should have carried out their own investigation and should have participated in the investigation by the British authorities. MR: — They could have said, for example, that the individual who the British believe is responsible… we will ensure that you are be able to question him in Moscow to ask him at an earlier stage to hear what he has to say and how he answers. Instead, it was all dismissed as being a fabrication and nobody believes that. You know, who had an interest in killing Litvinenko? The Russian government had. The Kremlin had. VM: — I have spoken to few Russian specialists in nuclear materials and they doubt that polonium in powder could have been used to poison anybody, on purpose. In Russia, it is strictly prohibited to take polonium in powder from any laboratory, unless it is in special industrial containers. How anybody could decide to carry polonium through Europe, through airports in Russia, Germany and Britain over passing special detectors, which were to detect the radiation, to carry polonium in powder, in an industrial container, and to poison somebody in London?! However, nobody officially asked this question, neither in the UK, nor in Russia. MR: — We all remember when the Bulgarian dissident was killed with an umbrella. Remember? MR: — Difficult, but not impossible. Difficult, but not impossible. But, he was killed by Polonium. VM: - Now, let us come to Brexit. MR: - Yes. VM: - Brexit, the election of Trump, growing popularity of right parties in Europe. Do these events have the same reasons, or they are the results of different trends? MR: - They have some things in common, but, inevitably, each country is different. In some cases it is populism. But again I come back to the point: the United Kingdom is in a unique situation. Many countries are Eurosceptic – in Poland, in France, in Netherlands. But because of their history they see being the European Union as reinforcing their democracy and their rule of law. And if I was from these countries I would cheer on EU. So they put up with the things that irritate them in the EU but they see it as overriding benefit from being in that structure. The United Kingdom is a very lucky country, we have not been invaded for a thousand years, since 1066, successfully. And our parliamentary system, our rule of law, has been uninterrupted since 1640s, since our civil war. It’s not perfect, but we’ve had a parliamentary system, we’ve had a rule of law, independent courts, getting better and better as it happens over 300 years. So, for us, if we are Eurosceptic, we say, well, we are not prepared to put up with this kind of aspiration of a supernational European government or European court telling us what we can do and what we can’t do. And that has been an issue of Great Britain’s relationship with the EU for many years, and that’s where Britain is different. And because we’re an island, we’re geographically that much different, we are to Europe what Japan is to Asia, a large separate country because it’s an island, culturally and historically has had a different historic experience. VM: - What is the reason for the rise of the right-wing parties? MR: - I can tell you. Because throughout the Cold War there was an overriding issue that dominated politics, which was what is gonna happen, how is this cold war going to end? Is Communism going to become the dominant political and economic system throughout Europe or will it be the other way round? And when you have some existential threat of that kind, then people are preunited in opposition. Some may support Communism, but the vast majority will be against. But the politics operated within that framework. And the countries of Eastern Europe, Poland, Hungary, Czechoslovakia, their main anxiety was that they will be able one day to become truly independent again and not be forced to adopt Soviet system, Soviet model. When we had the end of Cold War, it wasn’t the end of history, it was the end of particular kind of history. And so Communism is no longer a threat, whatever one thinks, Mr. Putin is not a Communist, he is not instituting Communism. There is no longer an alternative ideology that divides Europe or divides the world. The ideology is gone! Of course, there are different kinds of capitalism, there different kinds of role and the government, but it’s all still basically a capitalist system. And against that background we need to have alliances, whether the European Union or NATO. Some people say they are too supernational and we don’t think like that. It is easier to argue that if the external threat is gone. We have seen what has happened in the case of NATO and Europe. There was a debate about whether NATO should have a future, until Mr. Putin started to do what he did in Ukraine. And right on their own people say: “Crikey, we do need NATO!” Once again there is a potential threat from Russia. They may be exaggerating, but that’s what they feel. VM: - Recently, the British Supreme Court has taken the decision that the UK government could not start the process of leaving the EU without the decision of the British Parliament. That decision created a real threat to Brexit and could lead to confrontation. The UK government has successfully overcome the crisis by passing in the Parliament, as you had predicted during our last meeting, the resolution allowing the government to initiate Brexit. The British government has initiated Brexit. However, it looks as if the confrontation is still possible. Tony Blair has called to “explain” people that they can still turn down Brexit. It looks as if some kind of an organizational center of the opposition to Brexit appeared in the UK, coordinating and boosting the opposition to the government. What is your opinion? Do we see the rise of the new political opposition, new political force? MR: - No, I don’t think so, because of two reasons. First of all, the government had already realized that the Court would reach this conclusion and had already been planning how to deal with that. So what it was an act of Parliament that was put before Parliament to ask the Parliament to authorize. And the Parliament divided, there was opposition. But the government have the support of a very large majority, because even people, who would have liked at present to remain in the European Union, most of them say: “Well, we have a referendum”. We promise the people this will not just be advisory, we would respect the decision. They have voted to leave, therefore we must do that. I mean, I voted to remain, but if I was a Member of Parliament I would accept that we now must start the business of leaving. VM: - So, you don’t think that there will be political crisis? MR: - There won’t be a crisis. VM: - The recent events in the US, including the resignation of the national security adviser Michael Flynn, have created an impression that anti-Trump organizational centre has also appeared in US and has already started actively working on impeachment of the US President. Who do you think form that centre or operate as its coordinator? MR: - I do not agree with your analysis. Michael Flynn lied to the Vice-President about his discussions with the Russian Ambassador. We do not know whether Mr Flynn’s discussions were with or without the knowledge of Mr Trump who was not yet President when the conversations took place. I am not aware of anyone working to achieve the impeachment of Trump . VM: - In Russia there is a growing feeling of a global war danger, of a possibility of a global war. MR: - I know. VM: - Is a global war possible in the modern world? If it is possible, where it may start? MR: - Nobody can say it’s impossible because things can happen by accident or by stupidity. But the single most important reason why people in Russia think there might be a global war it’s because the Russian government has told them there might be a war. I have a personal experience of this. I served on the OSCE, eminent persons panel, there was a Russian colleague on that panel, and his contribution was the same as speeches in the Kremlin. Saying: “Ah! The way NATO is behaving! We must get used to the fact that nuclear weapons may be necessary. Russia will not hesitate to use its nuclear weapons if it needs to”. That kind of language which nobody in the West has used. Trump does not use it, hopefully not yet anyway, and no American President or British Prime Minister has used that kind of language. Although we have deep differences on Ukraine and other issues. The idea is that it is relevant to whether we will get into a nuclear exchange. VM: - Do you think that this is because of the language? MR: - Deliberate language. I think what I believed has happened. VM: - Or because of the actions, real movement in this direction? MR: - No. I believe the Russian government had two objectives. First of all, was to keep support in Russia for its policy by saying the West is so aggressive and so hostile this could lead to another war. But I think they had a second objective and still have the second objective which is trying to influence public opinion in Europe and in America to make people soon nervous about what it might lead to, a third World War with the nuclear weapons. And that Western governments will be under pressure from their public to be more helpful to Russia, to consider more than they might otherwise. I think that’s been part of a deliberate strategy. I don’t think Putin wants a war, I don’t think he will maybe want a war. You have to be a lunatic to want a nuclear war. So, but the language that suggests nuclear weapons might need to be used has become… I can give you a dozen of extracts from speeches of Russian leaders. I cannot give you a single extract from any American, or British, or French or German leader suggesting the same. It’s been a deliberate choice of rhetoric. Very determined. VM: - The last question. This is about Litvinenko case. MR: - Litvinenko? Yes, yes, absolutely! VM: - What is your opinion on Litvinenko case? Ten years have passed, but there are many points not clear and the case is still influencing the British-Russian relationships. What do you think that United Kingdom and Russia should do to close this page in the bilateral relations? MR: - Well, it goes back to what happened. What happened was that in the streets of London a citizen, a person was poisoned. He died of Polonium poisoning. And the evidence points to this being done by people from the Russian Federation. We had an inquest, we have our inquest not controlled by politicians. Our judges are not able to be told what to do, they did a very deep inquiry. That inquiry led to a conclusion, which was also the conclusion of our intelligence agencies and of all the others who delivered to this that it was undoubtedly a Polonium poisoning, they have identified the individual responsible. Litvinenko was a British citizen at the time of his death. No one in Britain doubts that Litvinenko’s murder was ordered in Moscow. And how does the Russian government react? It appoints the individual responsible to the Duma and treats him as a hero. So, I’m afraid, you know, Russian government, Mr. Putin is an ex-KGB man, you know, he is familiar with this sort of tactics against the enemies of the state as they’ve all seen. The refusal of the Russian authorities to allow a proper investigation combined with the appointment of his alleged killer to the State Duma has poisoned efforts to improve bilateral relations. And if your questions are how we can improve relations… Some acknowledgement of responsibility. Now it is just missing. It is propaganda and fabrication. Would be helpful. There is now, in my view, a serious interest on the part of the British Government to see whether 2017 can see the beginning of better and more positive co-operation between the two countries. The visit that will soon take place of the Foreign Secretary, Boris Johnson, to Moscow will be an important diplomatic development. Johnson will not be going to Moscow with any great expectations. In a recent interview, he said “Russia needs to give a sign that it can be trusted”. Trust, as I indicated earlier in this interview, was what developed between Thatcher and Gorbachev. Without trust there would have been no peaceful end to the Cold War. Without some rebirth of trust Russia and the West will not resolve their current differences. VM: - I agree with you that the reaction of Moscow is very strange. There was no investigation, no explanations were given. The former Russian officer, the officer of the FSB, dies of polonium powder in London, and Moscow officially does nothing to investigate this case, to protect the reputation of Russia, FSB, Kremlin, Vladimir Putin, who is openly blamed and accused in the West… I think that they should have carried out their own investigation and should have participated in the investigation by the British authorities. MR: - They could have said, for example, that the individual who the British believe is responsible… we will ensure that you are be able to question him in Moscow to ask him at an earlier stage to hear what he has to say and how he answers. Instead, it was all dismissed as being a fabrication and nobody believes that. You know, who had an interest in killing Litvinenko? The Russian government had. The Kremlin had. VM: - I have spoken to few Russian specialists in nuclear materials and they doubt that polonium in powder could have been used to poison anybody, on purpose. In Russia, it is strictly prohibited to take polonium in powder from any laboratory, unless it is in special industrial containers. How anybody could decide to carry polonium through Europe, through airports in Russia, Germany and Britain over passing special detectors, which were to detect the radiation, to carry polonium in powder, in an industrial container, and to poison somebody in London?! However, nobody officially asked this question, neither in the UK, nor in Russia. MR: - We all remember when the Bulgarian dissident was killed with an umbrella. Remember? VM: - The umbrella with the poisoned needle is not an industrial container with polonium powder. It is difficult or impossible for a person, who uses “umbrella” to kill himself, but a person, who tries to poison another person with the polonium in powder, has equal chances to poison a target and to poison himself, as well as all people around. Everything in that story looks so unrealistic, so stupid and so silly, so difficult and unreasonable to be true... MR: - Difficult, but not impossible. Difficult, but not impossible. But, he was killed by Polonium. 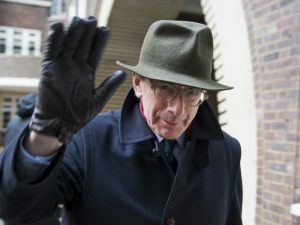 Запись опубликована в рубрике Великобритания, Политика с метками litvinenko, malcolm rifkind, Trump. Добавьте в закладки постоянную ссылку.